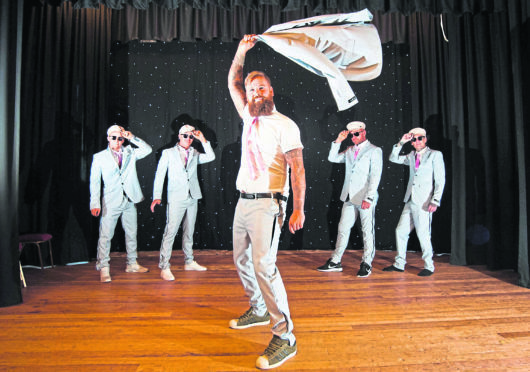 Full Monty at Lossiemouth Town Hall to remember Dion Yates, who died from cancer a year ago. In photo at the front Shaun Ingram. At the back from the left Scott Wilson, Mick Rogers, Ryan Thomson, Chris Glover. Campaigners in Moray have bared all in a revealing fundraiser to remember a teenager who died from cancer. This week marks one year since Dion Yates, from Lossiemouth, lost her year-long battle against a rare bone disease when she was just 18. Last night, five men performed the “full monty” in the youngster’s hometown as part of an event to celebrate the life of the popular teenager. Moray men Shaun Ingram, Chris Glover, Scott Wilson, Ryan Thomson and Mick Rogers all performed in front of a packed audience at Lossiemouth Town Hall after months of rehearsals. Funds raised from the dance routine, which was advertised with the slogan “You can leave your fat on”, will be donated to the Do it for Dion Foundation, which is being set up in memory of the kickboxing enthusiast. Kerry Yates, Dion’s mother, said: “We wanted to do something to mark the anniversary, something a bit different. Mrs Yates is currently in the process of establishing the foundation to honour her daughter, which will also support families of teenagers affected by diseases other than cancer. She added: “We want the money to help people who were in a similar situation to Dion. “There are a lot of charities for children, which is obviously a worthy cause, but there’s not many specifically for those in their late teens. Dion, who was originally from Middlesbrough in the north of England, captured the hearts with her determination in the face of cancer. The kickboxing enthusiast vowed to continue coaching new recruits at the Empower Martial Arts Club in Lossiemouth – even if she needed to have a leg amputated and half her pelvis removed to stop the disease spreading. Nearly 3,000 people attended a massive fundraiser in Middlesbrough during the summer to support the Archie Foundation in Aberdeen, which supported the family during Dion’s spells in hospital.